Congratulations to the following CSYM students for their well-prepared performances and master-class lessons with pianist and GSMD professor Charles Owen, who returned for the fourth time to teach our advanced pupils As always Charles seemed to give more with each successive lesson, and the students came away with many valuable points to target their practice. Any masterclass experience provides a performance goal for students and never fails to sheds new light on familiar repertoire, much of which takes many months, even years, to bring up to a sufficient performance level. The following CSYM students were invited to take part in a day of masterclasses with Kathryn Stott on Sunday 23 June: Sarah Chung, Zak Cebon, Noa Cebon, Lucas Kantaris, Nathalie Kantaris, Roxanna Shini, Ben Somers-Heslam and Alice Wood. Thanks to Dr Sophie Turenne, the masterclass took place in the peaceful and beautiful surroundings of Murray Edwards College, with the use of the lovely grand piano in the Fellows' Drawing Room - the perfect setting for a thoughtful and intimate day of student performances and lessons with an internationally renowned pianist. From 9:15AM-3PM, students played and studied a wide range of advanced piano music (Grade 8 through Diploma Level ) by composers Mendelssohn, Ravel, Debussy, Albeniz, Ginastera, Villa-Lobos and Prokofiev. It was disappointing not to see more older students observing these special lessons, but exciting to see students age 5-7 in Books 1-2, as well as those age 8-10 in attendance, including: Nicolo Ooi, Alexander Whitehorn, Jerome Turenne-Rogers, Joshua O'Neill, Olivia Macrae, Eleanor Thompson, Imogen and Olivia Ransome. Setting up a masterclass with a professional artist is no mean feat: dates must be discussed and negotiated, a suitable (and inexpensive or no-charge) venue with high quality grand piano needs to be found, professional fees agreed upon, students and programme scheduled. So special thanks must also go to Stephen for contacting Ms Stott in the first place and arranging this special event for the benefit of all our students. 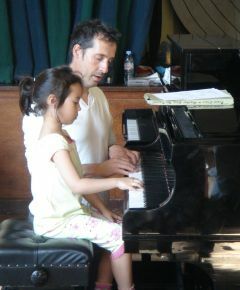 The master-class setting provides a unique occasion for parents and students alike to hear more advanced works in depth, to learn from a professional pianist's comments and suggestions, and be inspired to practice and perform works of sufficient standard so that one day they too might receive help and encouragement from a master-teacher. 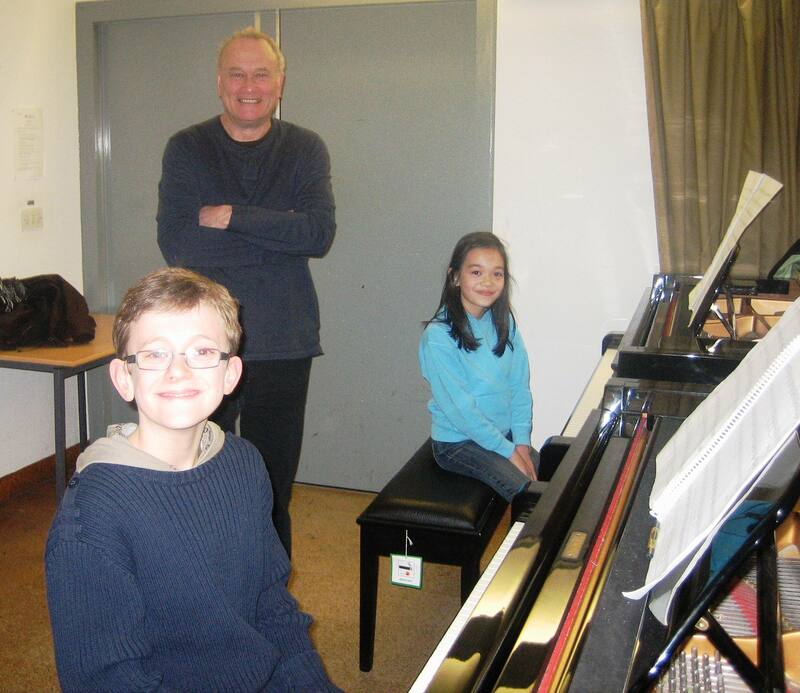 Alexander (age 5) Whitehorn's father reported he was happy to recognise both piano work and young pianist at Saturday's concert after attending the masterclass. In this way, "Masterclass" will take on significant meaning for those who participate and observe, particularly in this perfect venue and with a personable, yet highly accomplished and versatile artist such as Ms Stott. As a recent prize winner of the prestigious International Piano Competition Junior Orleans, "Blade of Grass", Zak was invited to perform at the birthplace of Claude Debussy outside Paris in Saint-Germain-en-Laye, on Saturday 22 June. Zak's programme included Charlotte Bray's "Albie", Kurtag's "Fugative thoughts on an Alberti bass", and "Musica Callanda" by Mompou. 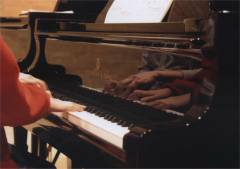 In the July edition of Pianiste magazine, Zak's Suzuki Piano background is mentioned as rather unique amongst other students who participate in this competition, and he is asked about playing the music of today; "I prefer to play contemporary music because everything is different - it's like a game". Well-done, Zak! Keep up the great work, and keep practicing! Zak's jet-set lifestyle continues as he is off next week to take part in another International Competition in Granada. March 2014 he plays in his fourth concert as a result of his success in the Orleans competition, playing in a very special concert in Paris for Kurtag himself. Congratulations to three CSYM students who participated in the first-round of the EPTA National Piano Competition in Cambridge at Gonville and Caius College on Sunday 3 February. 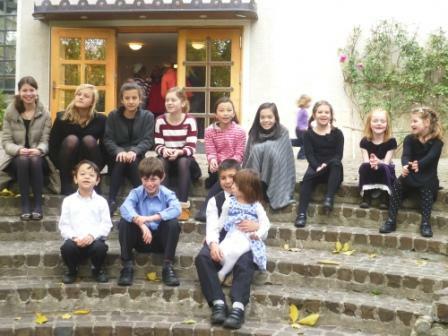 Imogen Ransome (age 8) performed works by Bach, Schumann, Rodrigo and Maikapar in the Elementary category; Noa Cebon( age 16) performed a pro-gramme of Shostakovich, Rameau and Rodrigo in the Advanced I (Grade 8) category, and Lucas Kantaris Diaz (age 15) performed works by Modesta Bor and Rachmaninov in the new 15 and under category. Twenty participants were adjudicated by Kathryn Page from Chethams School of Music, and all received praise for their careful preparation and high standard of performance practice. Imogen and Lucas both received Highly Commendeds for their performances, while Noa received a Distinction, making her eligible to take part in the second-round of the national competition at Chethams School later this year. Win-ners were awarded certificates and gift vouchers from Brian Jordan's Music Shop. Learning, polishing, and maintaining a 5-10 minute concert programme at a high level of mastery requires steady effort, deep practice and equal amounts of patience over a relatively long period of time, from 1-2 years. It is not something we recommend for every student, and only when we believe the process will help develop something further in the child. With encouragement and helpful feedback from the adjudicator, the competition experience can offer another kind of performance opportunity, a chance for further growth and a positive experience overall. Olivia Ransome and Zak Cebon were two of seven young pianists invited to perform in the Recital Hall at Chappell of Bond Street, London on Saturday 15 December. All students were prize winners of the 2012 EPTA UK Piano and composition competitions, having previously performed at the second round concerts in Manchester at Chetham's School of Music. The concert presented further opportunity to hear a wide range of piano repertoire from elementary through diploma level, including works by Bach, Mozart, Haydn, Clementi, Schubert, Chopin, Debussy, Tchaikovsky and Liszt. Winners of the annual EPTA composition prize were also given opportunity to perform their works. The setting was friendly and informal with refreshments served af-terwards, and many students took the opportunity to do some music shop-ping on site before venturing into Oxford Street to join the pre-Christmas excitement. Congratulations to Olivia and Zak for their extra efforts and fine performances. On Saturday 27 October, twelve CSYM students ages 10-18 and their families gathered at the Auditorio Joaquin Rodrigo at the Eduardo Urculo Cultural Centre in Madrid for a special concert of music by Joaquin Rodrigo and other Spanish & Latin-American composers. The programme was shared with eleven Spanish piano students and performed to an enthusiastic audience of about 200 people. The programme was introduced by Rodrigo's daughter, Cecilia, director the Rodrigo Foundation and concert-organiser, and with the help of Geoffrey Kantaris' on-the-spot translation, Stephen was given the opportunity to express his gratitude to the Foundation and to all those supporting the concert. All CSYM & Madrid students were extremely well-prepared, coping well with the unknown elements (different piano, venue and audience) and performing at a high standard. The audience was highly-attentive and most-appreciative, as Jon Shallcross described afterwards: "The 'duende' was truly with all the children on Saturday and it was great to hear Spaniards in the audience murmuring '¡vale!' and ¡bien!' during the performances, as though we were all at a flamenco gig. Audience participation of this sort is something I fully believe we should introduce at the next West Road concert. Many, many thanks to you both." The Spanish teacher was also very pleased with the outcome of the concert and the opportunity to explore the music of Rodrigo which she hadn't done before. Impressed by CSYM students' ability to bring out the Spanish rhythm and soul of the music. "How did you do that? ", she asked Stephen, and he replied that most of the students had been studying the music through the recorded performances of the Rodrigo himself. The first thing she asked Stephen after the concert was "When are you coming back?" After having to cancel the original plans back in February due to snow(! ), it was wonderful to finally have Suzuki Piano Teacher and ESA Teacher Trainer, Caroline Gowers, here in Cambridge to teach Book 2-3 students and talk to parents about the Five "S's" of Practice. 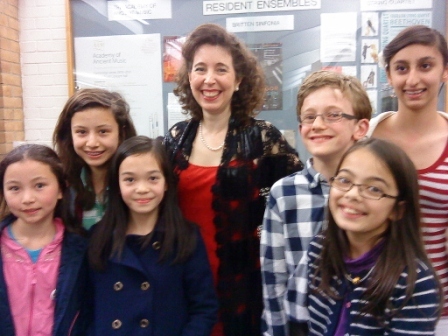 Caroline has taught at several of our summer schools in past, and her students have participated in joint concerts with CSYM students at West Road Concert Hall. Along with Stephen, Caroline was one of the first team of piano teachers on the British Suzuki Institute's training course back in the 1980's. She is a frequent guest teacher at workshops throughout Europe and abroad, and shares her expertise as parent, musician and teacher with wit, wisdom and a full heart. Her lessons on Twinkle Variations and repertoire pieces went straight to the smallest "bits"" to encourage children to pay attention and listen very carefully to everything they are doing. Each student was well prepared and so she was able to make the most of each thirty minute lesson. 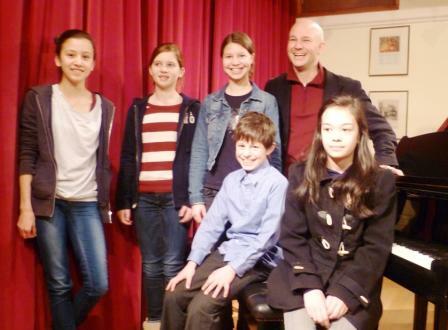 Twelve CSYM students age 11-15 had the rare opportunity to take part in master-class lessons taught by pianist Charles Owen on Saturday 4 February 2012 at the Cambridge Pianoforte Centre in Kings Hedges Road. We were very fortunate Charles could schedule this second visit to Cambridge, as he is in the midst of teaching at the Guildhall School of Music and Drama while also preparing for a string of performances in the UK and abroad from now through August. In fact while he was in Cambridge telling us about winter in Moscow, he received an invitation to perform a recital there next year! Students, parents and observers were treated to a marvelous range of late intermediate through advanced repertoire being studied, including works by Bach, Rameau, Scriabin, Rachmaninoff, Mompou, Gubaidulina, Debussy, Medtner, Bach, Liszt, Rodrigo, and Shostakovitch. The students were well-prepared and many were able to give deeply committed and adventurous performances encouraged by Charles' imaginative suggestions and passionate coaching. Grateful thanks to Stephen Power for organising this very special event, and our thanks also to the staff at Cambridge Pianoforte Centre for their friendly and helpful arrangements behind the scenes on the day. You can visit Charles' website for more details about his upcoming concert performances: http://www.charlesowen.net/diary/ These include concerts in London, throughout the UK, and in Italy, Austria and France. Google Kings Place to watch an interview with Charles & Katya Apekisheva and hear them performing one of the Brahms duets they will be per-forming at Kings Place on 18 April. 36 CSYM students from age 3-16 performed a splendid programme of varied music, ranging from Suzuki Books 1-3 to works by Rameau, Granados, Rachaminoff, Faure, Chabrier, and featuring solo and duet works by Gyorgy Kurtag. Each and every student was extremely well-prepared and did their best, many putting into effect what they practiced just a few hours earlier at dress rehearsal. Despite the near-tropical temperatures inside the Lecture Hall, the patience, concentration and efforts of both children and parents could not fail to impress. Afterwards the students enjoyed a tour of the house and a variety of Bartok memorabilia. Stephen and Betty were happy to pay their tributes to the great pianist, composer and ethno-musicologist, Bela Bartok. Many CSYM families were able to combine a few days' holiday touring the city, with visits to hot spas and swimming pools, travel on trams and metro, marvelling at the stunning architecture and the picturesque views along the Danube. Others visited historical museums, attended music and theatre events, or took time out to visit the Budapest city apartments once inhabited by Franz Liszt and Zoltan Kodaly. Everyone enjoyed breakfasting together and returning to the hotel to share the day's experiences. Remembering the host of Great Composers looking down at us from atop the Opera House, I'm sure we would all agree that Budapest is a most inspiring city for young musicians. CSYM members receive regular newsletters from Stephen and Betty Power which contain much useful information and advice, as well as various news items. Some of the information can be found elsewhere on the website in the appropriate section and a few of the current news items appear on the left. If you would like to see the newsletter in its original form, it is available to download for CSYM members only, here as an Adobe Acrobat (PDF) file. This paragraph is a kludge to get around the bugs Microsoft can't be bothered to fix in Internet Explorer - sigh!